Seven attacks in ten days. In response to the recent attacks against women in the city of Bangalore, many individuals and organsiations have come together to form FEARLESS KARNATAKA or Nirbhaya Karnataka to reclaim public spaces and promote safety for all. In the wake of a series of attacks in Mangalore (the latest one was reported on February 24, 2009), women have been targeted in the name of morality, culture and “public decency”. The attacks in Bangalore seem to be a continuation of those that took place in Mangalore and coastal Karnataka regions – even though the identity of the attackers (and the organizations they belong to) could have differed. 1. A protest march to the office of Dr. Ajai Kumar Singh, DG & IGP, on March 7, 2009. There are several other efforts, including signature campaigns, art exhibitions, etc which are happening simultaneously..
Dramanon, the young theatre group of Bangalore, is staging “Alarms and Excursions” on Feb 5th & 6th at Ranga Shankara. Alarms and Excursions by Michael Frayn, is both farcical and comic. The play comprises of two playlets that share a central theme: a humorous & critical commentary on disconnection between people. The play explores the obtuse humor in our off the hook, disconnected relationships with ourselves and with each other – and the resulting tragic-comedy of such a set up. The first playlet “Doubles” involves two couples who check into identical hotel rooms next to each other. Their rooms, which are mirror images of each other, are separated by thin walls. Through the play, we slowly discover that the only thing that eventually separates them is not the physical wall between the rooms, but the invisible walls between each other. The second playlet “Immobiles,” is an exposé of human disconnection in a world without mobile phones. A frustrated couple tries to coordinate a proper meeting place using an answering machine and coin operated phone booths for their foreign friend when he arrives at the airport. Broken bones and broken hearts are the result of this techno faux pas. The Bangalore School of Speech and Drama staged Mozart Chocolates’, a play written by Dr.Ketaki Kushari Dyson and directed by Dr.Zulfia Shaikh, who also took on the role of the main character, Ila. 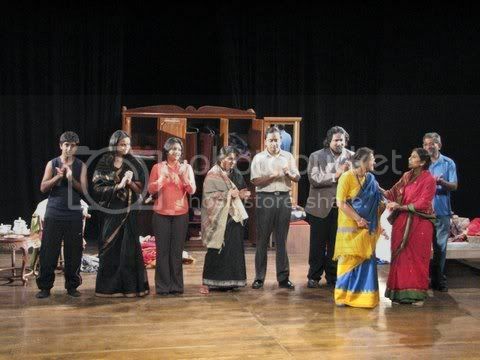 This was the premiere of the translation of the Bengali play. On a rainy day which has brought floods, Ila, a Bengali woman living in England, is folding and re-arranging the saris that have accumulated over the years in her wardrobe. Her friend Lipi arrives and they discuss an eclectic range of subjects including the hollowness of academic jargon, the state of women in ancient and modern times and chocolates ! On occasion of Gandhi Jayanti and the long weekend following, city vibes keeping its patrons busy with various means. 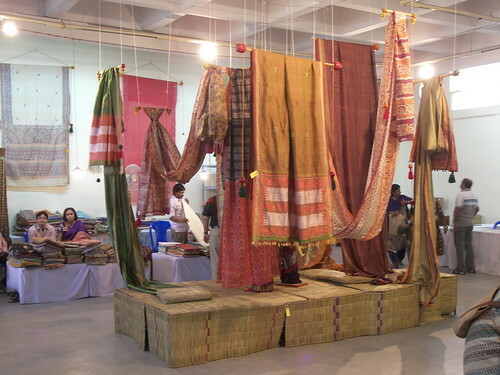 A range of Indian sarees displayed in the center of a art gallery of Chitrakala Parishat, housing an exhibition of traditional Indian sarees. Artisans and traders from various parts of the country participated to showcase their expertise and range.